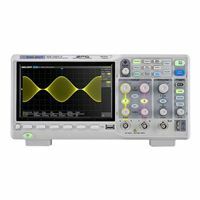 The Siglent SDS1202X-E offers more performance and features than any other oscilloscope in this price range. Included with its 200 MHz bandwidth are a sample rate up to 1 GSa/sec, up to 14 MPts of memory, and sensitivity down to 500 uV/div. Serial trigger and decode are standard and the '1202X-E can trigger as fast as 100,000 times per second (400,000 in the Sequence Trigger mode). The digital phosphor display includes both a intensity-grading mode as well as a color 'temperature' mode. It also includes a 1 MPt FFT, cursors, math, and USB/LAN interfaces.